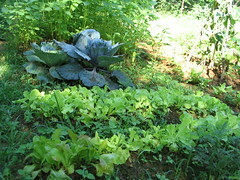 At the end of spring, Duh dwellers were offered opportunities to own a small garden plot. I was really excited then, thinking of all the wonderful vegetables that I could plant and harvest. But I didn’t manage to call to reserve a garden plot, so I shared one with my friend, Alis. She’s busy completing her dissertation and I was busy getting my thumb to bend again. 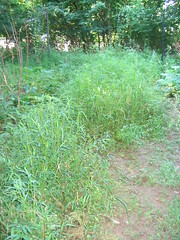 So here’s our garden plot of weed! 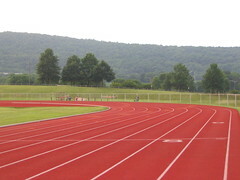 This is the running track where I train for the 5K run. I’m starting the 6th week of the 13-week walk/run program soon. In my last session, I ran 3 minutes, walk 1 minute, and repeated that 9 times. I’m amazed that I’ve come so far. I can still remember I couldn’t complete my first session. Nowadays, I don’t usually run with the feeling that I have to give up soon, I am now pretty confident that I can complete the session but knowing that it’ll still be tiring. My legs and feet still hurt but they don’t feel like they are going to break. My lungs are OK. It’s funny, one of the advice in the book is to run slow enough that I can carry on a 1 or 2 sentences conversation, there’s no way I can run, no matter how slow, and talk at the same time now. In the coming session, I’ll have to run 5 minutes, walk 1 minute, and repeat that 8 times. 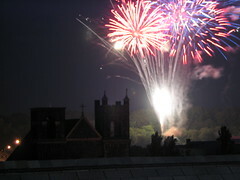 This is the first time I made the time to watch the 4th July fireworks in Bethlehem. I think last year I heard the fireworks but was too lazy to walk out of the apartment to watch it. I was up on the top floor of a parking garage for this year’s fireworks display. Took 2 photos and decided that it’s better to concentrate on watching it then fiddling with my camera…since most fireworks photos look alike.